The second anniversary is that of the 2008 financial crisis—perhaps the starkest sign of the palpable failure of the Fair Housing Act to fulfill its mandate. Not only did the crisis wipe out decades’ worth of hard-won financial gains for African Americans, but it stole their homes as well. In 2010 almost half a million African Americans were at risk of foreclosure, and by 2014 more than 240,000 had lost their homes. This historic collapse in Black homeownership is an important part of why the wealth gap between Black and white Americans is larger today than it has been in decades. In 2007, right before the crash, the median white family had eight times the wealth of the median Black family. By 2013, that figure had risen to eleven times, and it has tapered off only slightly since. The subprime mortgage crisis, and the wider housing and economic crisis it produced, was the culmination of a long period of predatory inclusion of African Americans in the housing market, which can be traced back to the era of housing and credit reform in the late 1960s and 1970s. After decades of exclusion, African Americans were finally promised access to the robust housing market that had fueled the ascension of the white middle class in the second half of the twentieth century. Instead, they were subjected to rapacious lending and real-estate practices that extended familiar patterns of discrimination. As the early-2000s housing bubble was peaking, African Americans were 50 percent more likely than their white peers to receive a subprime loan. Those loans, it is widely understood today, were more expensive and carried higher interest rates. The terms of these loans increased the probability of their failure, and their concentration in Black neighborhoods promised not just to ruin an individual’s credit but to undermine the stability of entire communities. The real-estate industry created the idea that Black homeowners posed a risk to the housing market and then profited from financial tools promoted as mitigating that risk. In the aftermath of the predictable failure of those loans, banks and other mortgage lenders today are using this failure as an excuse to revert back to the exclusionary practices that gave rise to exploitative lending in the first place. This has included the resumption of the use of land-installment contracts, requiring “owners” to pay property taxes, make substantial repairs, and pay usurious interest rates while having no equity in the property. There has also been the revival of rent-to-own schemes that lure poor and working-class people into making expensive payments for substandard properties when they no longer qualify for mortgage loans of any type. How could “fair housing” fail so spectacularly, forty years after it was signed into law? Recent scholarship, including lawyer and social scientist Richard Rothstein’s much-heralded book The Color of Law: A Forgotten History of How Our Government Segregated America, has helped to shine a light on the nefarious role played by the government in locking African Americans into substandard housing and under-resourced public services from the early twentieth century on. Rothstein and others, however, fail to answer the question of why this discrimination persists long after the federal government formally renounced its own policies promoting segregation. A common explanation points to the continued resistance of white residents, renters, and owners to the presence of Black people in their communities. White violence and resistance is certainly part of the explanation, but lacks the institutional underpinnings that were so critical to understanding the role of the state in the formative years of residential segregation. For a fuller picture, we need to look to the one factor that has remained a constant even as administrations, policies, and public attitudes have changed. We need to look at the public-private partnerships that have sutured the federal government to the real-estate industry. Fifty years after the passage of “fair housing,” racial discrimination remains embedded in the operations of the American housing market. The federal government’s failure to enforce its own laws against racial discrimination is a reflection of its institutional racism but not an explanation. One explanation for the failure of federal housing policies to actually produce “fair” housing is found in the state’s continued reliance on the private sector as the sole provider of housing in the United States. The federal government long ago abdicated the responsibility of directly producing affordable housing, instead outsourcing the task to private developers—while continuing to provide vast amounts of assistance in the form of guarantees, subsidies, and tax relief. As a result, it has absorbed the real-estate and banking industries’ historic embrace of racial discrimination. Indeed, the real-estate industry grew in tandem with and helped to popularize racist, even eugenic ideas about African Americans, including the notions that Black residents negatively impact property values, are undesirable neighbors, and pose an existential risk to communities and neighborhoods. As early as the 1920s, the National Association of Real Estate Boards had threatened professional discipline against any agent who disrupted segregated neighborhood racial patterns. As the government got more involved in regulating and subsidizing housing, these ideas translated directly into policy. The notorious redlining maps issued by the federal Home Owners’ Loan Corporation in the 1930s, to take one early example, were based on existing maps used by local banks and brokers. It’s not hard to see why: starting in this period, real-estate executives were recruited to develop government housing policies because of their former roles within the private sector. Over time, the real-estate industry, in turn, would seek out former government employees for their valuable connections to the state. With this “revolving door” in place, public and private networks formed an insular feedback loop mostly concerned with maintaining a brisk housing market. The real-estate industry flexed its enormous influence over national policy again and again over the following decades, including when it vociferously—and successfully—lobbied to hobble public housing in the 1940s and 1950s. But the modern iteration of this destructive public-private apparatus was born with the Housing and Urban Development (HUD) Act of 1968. While the Fair Housing Act is widely recognized as a landmark in U.S. policy, the accompanying HUD Act is virtually unknown today despite its equally seismic shift in American housing policy. The HUD Act was passed in August 1968, four months after Johnson signed the Fair Housing Act into law. It was a historic piece of legislation that decisively shifted the responsibility to provide housing for poor and working-class people from the federal government to the private sector. In the years of urban uprisings that roiled the mid-1960s, poor and substandard housing was repeatedly listed as a catalyst of Black rage. For example, a report on the causes of the Black rebellion in Philadelphia in 1964 found that 100 percent of rat bites reported in the city (and the resulting deaths) happened in segregated Black neighborhoods. From lead poisoning to a lack of indoor plumbing to general dilapidation, urban housing occupied by African Americans was overwhelmingly in substandard condition. The poor quality of Black housing was driven by three factors. It was typically older and used, having filtered down to African Americans who were the newest arrivals in Northern cities. Its already distressed condition was then exacerbated by residential segregation that led to overcrowding, as Black residents were hemmed into a few clustered neighborhoods. Finally, the lack of housing choices available to African Americans removed the pressure from landlords to improve the quality of housing. African Americans were a captured market with nowhere else to turn. Meanwhile, the government was heavily subsidizing the construction of exclusive suburbs, whose value for upwardly mobile whites was based in large part on their distance from Black neighborhoods and exclusion of Black people. Where white suburban neighborhoods came to be valued as appreciating assets for the households who lived in them, Black urban neighborhoods were prized by the real-estate industry for their extractive value. If the real-estate industry was eager to keep “white neighborhoods” and “black neighborhoods” apart, then, it was not because of prejudice alone—it was because of profit. The result was African Americans paying more for inferior housing in comparison to whites who were being lured to new suburban developments during this same period. By the mid-1960s, these conditions had reached a breaking point. The 1967–68 urban uprisings—the largest wave of domestic riots in the twentieth century—were the result. Passed through Congress even as the wreckage of rebellions was still visible, the HUD Act, in tandem with the Fair Housing Act, was intended to transform American cities and suburbs. Unlike Fair Housing, the HUD Act produced no partisan rancor and instead was celebrated by Democrats, Republicans, and of most significance, the real-estate and banking industries. Both parties promoted homeownership as a way to give Black urban residents a stake in society in hopes of quelling the uprisings. But there was also the added motivation of developing a new market. The legislation emphasized “private enterprise” as the cornerstone of urban renewal. The federal government enticed the participation of the real-estate industry and mortgage lenders essentially by paying them to produce housing for low-income people. Its most significant features included a federal mandate to create 26 million units of new and rehabilitated housing within ten years, including 6 million units for low-income residents. It also included a low-income renter program allowing nonprofit organizations to buy residential buildings cheaply with low-interest loans, with the aim of passing the savings onto renters. Finally, Section 235 of the bill created a homeownership program for low-income people through a combination of interest-rate subsidies, a low down payment, and the promise of mortgage insurance from the federal government. In 1967, a year before the Fair Housing and HUD Acts were signed, a summer of riots had compelled the Federal Housing Administration (FHA) to finally end its three-decade-long practice of redlining urban neighborhoods, while unveiling multiple new initiatives aimed at increasing the rates of homeownership in Black urban areas. A consortium of life insurance companies donated $1 billion to create a mortgage pool for single-family homes and multifamily buildings in areas that would have previously been redlined. This meant that money was finally available, but only to buy within the city—not outside of it. Ending the urban housing crisis required going a step further; it required actively providing African Americans with access to safe, sound, and affordable housing inside and out of cities, especially in areas where they had long been denied it. The HUD Act’s mandate to produce 6 million units of low-income housing seemed to deliver on this promise, and for this reason was welcomed by many Black buyers and renters. But the legislation also revealed fault lines within the industry. Homebuilders were ecstatic about the new legislation because it put federal muscle behind building new homes, but real-estate brokers demanded a greater percentage of homes be “existing” or used and that more money be allocated toward rehabilitating dilapidated homes in urban neighborhoods. “New” housing was largely located in suburbs and “existing” housing primarily in cities, meaning that a color line would divide the types of housing available. As a result, builders became advocates of fair housing, while real-estate trade groups, hoping to preserve the existing housing in segregated cities, denounced it as “forced integration.” They couched their critique in terms of defending consumer “choice,” including the right to choose one’s own neighbors. Compounding the problem was the fact that the HUD Act was never really Johnson’s legislation to implement. Within months of being passed, it was inherited by the Nixon administration. At first, there were signs that Nixon might see the fair housing initiative through. The first director of HUD he appointed was former Michigan Governor George Romney, regarded as a racial liberal who had helped Michigan pass statewide fair housing laws. But Nixon’s political fixation on maintaining his white “silent majority” electoral coalition quickly came into conflict with the objectives of the new housing legislation. Nixon grumbled to his aides about “forced integration” and argued, instead, for a vaguely defined “open society” with “open choices”—including the right to not choose integration. Meanwhile, senior officials dismissed federal fair housing regulations as red tape that hampered the abilities of business. If there was ever a need for strict oversight and a high-functioning regime of civil rights law enforcement, it was during the initiation of a massive low-income homeownership program directed at African Americans. Instead, the Nixon administration pursued a doctrine of “new federalism”—an analog of states’ rights—which allowed decision-making and oversight of implementation to be deferred to the multiple and new local installations of HUD. Romney’s efforts to decentralize HUD’s operations (largely at Nixon’s behest) by unnecessarily dividing smaller regional offices into even smaller local offices helped to siphon powerful oversight authority away from HUD’s headquarters into the hands of local housing agents. The Nixon administration lauded local control over the dictates of so-called “Washington bureaucrats,” and HUD became a test case not for centralized oversight but for Nixon’s commitment to local control. This would have real consequences in the implementation of all of the new programs outlined in the HUD Act, but especially when it came to making low-income Black renters into low-income Black homeowners. 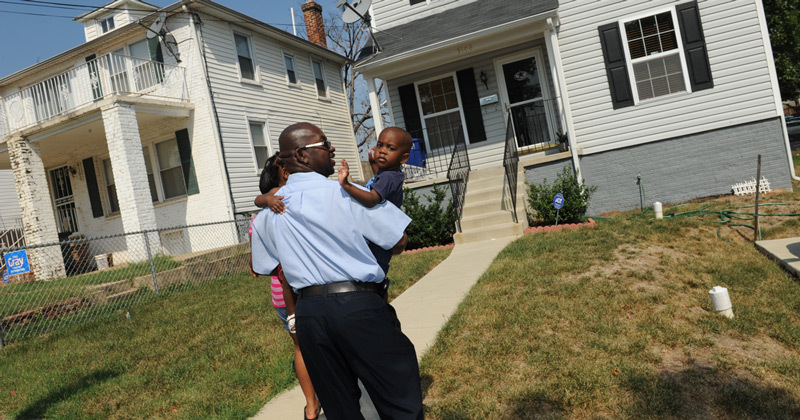 HUD’s new homeownership program relied on real-estate brokers and mortgage bankers to operate. Brokers held lists of houses for sale and they, in collaboration with mortgage lenders and agents from the FHA, determined which buyers qualified for the low-income homeownership program. In effect, the federal government outsourced the role of its inaugural low-income homeownership program to an industry long predicated on racial segregation. This policy incentivized real-estate speculators to buy distressed urban properties for pennies, invest in minimal maintenance and repair, and then facilitate a home sale for thousands more to someone desperate for housing. With FHA backing, bankers and brokers were on the hunt for potential clients. Government subsidies and mortgage guarantees amplified exploitative real-estate practices. The FHA guarantee encouraged the invigorated home sales through a variety of government-sponsored programs (not just Section 235). The HUD Act had also created a secondary market just for the sale of low-income homes, Ginnie Mae, guaranteeing that every low-income mortgage would be bought, packaged as a security, and then sold to long-term investors. The practice promised an unlimited flow of available cash, making the low-income housing market ripe for plunder. There was no shortage of people living in American cities desperate to find a place of their own. Speculators preyed upon Black single mothers on welfare who were particularly desperate for housing. In St. Louis, one real-estate broker sent thousands of postcards advertising Section 235 housing to residents of the crumbling Pruitt-Igoe homes in hopes of luring them into buying a house. Real-estate speculators sold thousands of homes with no water heaters, nailed-shut windows, leaking roofs, rat infestations, and worse. Federal subsidies and mortgage guarantees resuscitated urban housing that had been left for dead. Miserable and dangerous housing conditions in the existing urban market led people to walk away from the homes they had recently purchased, and the numbers of defaults, foreclosures, and FHA insurance payments began to rise. By the end of 1973, 10 percent of Section 235 homes were in foreclosure, along with tens of thousands more in other FHA-assisted low-income homeownership programs. In May of 1974, HUD was in possession of 78,000 single-family homes. Corrupt mortgage lenders quickly foreclosed on new homeowners to cash in on lucrative fees and sprawling closing costs, while real-estate brokers moved in to quickly resell the broken property and start the lucrative process all over again. Almost all of the properties were in cities. In an emergent age of investigative journalism, newspapers from around the country took note of the foreclosures, but more importantly, of the role of HUD in facilitating the sale of junk property to poor people. These were not only scandals, but crimes that had been committed against poor and working-class Blacks and Latinos. In cities as diverse as Chicago, Detroit, Philadelphia, Seattle, San Jose, and Columbia, South Carolina, real-estate brokers, FHA officials, and mortgage bankers were arrested and indicted for a criminal conspiracy to commit fraud. By 1974, twenty-eight HUD officials had been indicted for their role in the housing scandal along with other mortgage brokers and real-estate brokers. The FBI was conducting another 1,930 active investigations for fraud. Republican-aligned newspapers like the Chicago Tribune took delight in headlines like “FHA Wastes $4 Billion and Creates City Slums,” but these failures were hardly the result of “big government” alone. Instead, their failure was rooted in a lack of oversight reflecting the deference of federal agents to private-sector profiteers. Where “risk” had once been invoked to keep African Americans locked out of homeownership, the FHA mortgage guarantee now turned it into a get-rich-quick scheme. Instead of highlighting how the relationship between business and public agencies had undermined the function of government regulators or how Nixon’s doctrine of “new federalism” had left federal regulators ill-equipped to oversee a program ripe for corruption—especially given the history of the real-estate industry’s dealings with African Americans—the narrative turned on the perceived domestic dysfunction of Black families as the root of the problem. Black women’s homemaking skills were called into question, as well as their overall competence as homeowners. Even as federal agents in the FHA were arrested for their role in the HUD-FHA scandal, the nation’s attention was trained on the poor program participants. Nixon officials used the spectacular collapse of low-income homeownership programs and the literal implosion of the Pruitt-Igoe homes in St. Louis (the city began demolishing the complex in 1972, less than twenty years after it was built) as evidence that the government should get out of the business of housing poor and low-income people. The highly visible collapse of the low-income homeownership program also allowed officials to gain support for keeping poor and working-class Black people out of white suburban communities. This was the beginning of the federal turn to Section 8 housing vouchers, first issued in 1974. The introduction of vouchers was coupled with a demand from the Nixon administration that the “existing” housing stock be utilized for low-income housing while new construction of low-income housing was to be scaled back. Further cementing the racial division in low-income housing, the Nixon administration secured $3 billion for the construction of new low-income homes. The qualification of new construction all but guaranteed this housing would be placed in suburbs and largely reserved for white residents. With existing housing in the cities for Black renters and new construction in the suburbs for white buyers, Nixon’s segregated vision for housing in the United States was fulfilled. But the destructive role of real estate and mortgage bankers in the operation of the FHA-assisted homeownership programs was essential to the process. The real-estate industry’s history of racism has made it an unreliable partner in solving the United States’ longstanding shortage of dignified affordable housing. Black families are disproportionately affected by the lack of housing precisely because long-standing racist myths have been used to influence notions of value and community desirability. Government has a long and sullied history of invoking race to shape the housing market as well. But government can be malleable to the demands of political protests and organizing, and changes of political representation can make it even more responsive to the public. Solving the perpetual U.S. housing crisis is complex, but it begins by disconnecting the power of government from the private sector’s insatiable profit motive. Keeanga-Yamahtta Taylor is the author of the forthcoming Race for Profit: Black Homeownership and the End of the Urban Crisis (University of North Carolina Press, 2019). Taylor is also author of From #BlackLivesMatter to Black Liberation (Haymarket Books, 2016). She is Assistant Professor of African American Studies at Princeton University.